We bought Knight Vision, in April 2006. She is 10.36m at the water line, 10.7m over all and 3.48m in the beam. She has a draft of 1.80m and displaces about 4500kg. 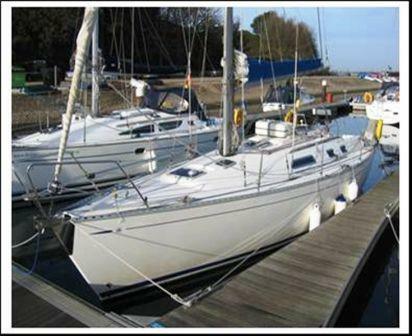 She was first in the water in 1999 and has been well used and cared for. The Dufour 35 is a CE Catergory A vessel, is capable of being at sea, in wind forces greater than force 8 and with a wave height greater than 4 meters. As can be seen she has 3 double cabins and can sleep 6 comfortably, 9 at a pinch. She has a well equiped galley, and reasonable storage, a good size chart table and under bunk and behind bunk storage, in fact everywhere there's a spare corner is more storage.